Tricia Dawn Williams at the piano with Tatjana Chircop and Lino Pirotta. The Manoel Theatre’s Sala Isouard was packed with people brandishing programmes, most of whom were fully aware of what to expect. Contemporary music attracts a certain type of audience but this time, possibly due to the inclusiveness of the International Spring Orchestra Festival, one could pick out different types of people in the crowd. There was some excitement, some silence. A couple of young women sat down in matching dresses, giggling at their first ever concert. A tourist and his wife, backpacks on their knees, closed their eyes in anticipation. Several children crowded around the front row, then the reserved seats were filled and the lights dimmed. The performance was made up of works by Paul Sayre, Veronique Vella, Edward Manukyan, Aram Kchachaturian and a concluding piece called Pan the Goat-God by Ruben Zahra, described in the programme as “driven by hard rhythmic patterns which support complex motives and intricate melodic lines.” Naturally. Equinox Trio features Tricia Dawn Williams on piano, Lino Pirotta on the clarinet and Tatjana Chircop on the violin. They decided to form a trio some three years ago and specialise in contemporary music. While this is not the kind of music I am immediately drawn to, it is always a pleasure to see people doing something they enjoy and it is obvious the Equinox Trio have a great love for their collaborations. 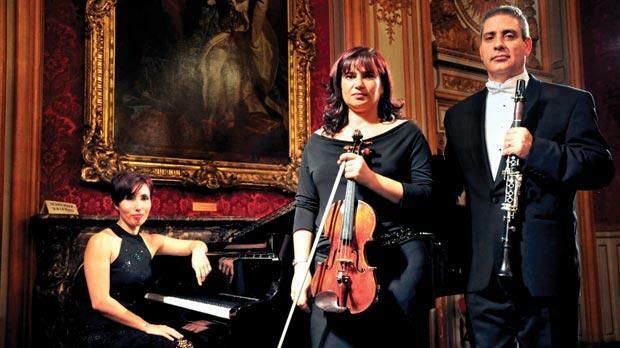 Their repertoire includes Bartok, Ligeri, Hindemith and they are keen to promote Maltese compositions and especially young Maltese composers. Another feather in their cap is that they premiere many arrangements and works created especially for them. The pianist looked beautifully calm and composed as she and her fellow musicians plunged into a world of controlled cacophony. The eerie call of the clarinet laced through frothy, evanescent and jarring music, appealing to a presumably sophisticated ear. The audience was challenged to wonder what music might be, and if we did not find it in the concert hall that night then where could we find it? The hypnotic effect of the work was interesting, especially during the trios by Edward Manukyan and Aram Kchachaturian. Zahra’s piece was haunting, offering an oriental (in the sense Said has given the word) mixture of references and troubled movement. I left the hall with a sense of the jaded, ironic, over-the-shoulder glimpses at moments of lost beauty that seem to be heavily invested in this kind of performance; a place of jangles and musical non-sequitours. Yet in having shared their performance, by opening themselves to the possibility of connection, it was interesting to observe Equinox Trio and explore their sounds. Perhaps the most important thing of all was that the experience made me question my own aesthetic sensibility, something we too often take for granted, and in the end, I left the concert having learned to appreciate it all the more.